We are swimmers and fishers. Bee-keepers and morning strollers. We are lake-lovers. And we are friends of Lake Cane. We believe in a Board that is active and taking part in projects where they can help the most. The LCRS Board is characteristically action-oriented. Board officers, directors and the group itself determine future resolutions and/or actions. For example: How, if at all, has this experience changed your thinking? What will LCRS do differently as a result of the experience? Our organization is committed to evaluating our experiences quickly yet with detailed reflection and learning. This helps us get to the heart of the matter efficiently. This is our means to formulate a common strategy. To support this, Board members are required to undertake a minimum of two classes each year that are related to LCRS’s mission. With the goal of being as transparent as possible in everything we do, especially finances, we use the website as a document management and reporting space. Reliability in our sharing of information, in communications overall, is our most important support function. 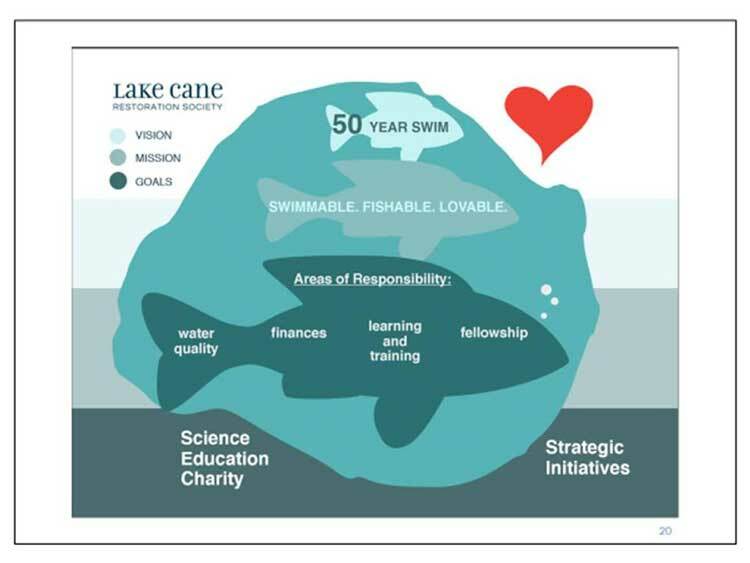 Every Friend of Lake Cane is encouraged to be part of our team, to help make the Swim sustainable not just with regards to the environment but also in learning, training, and fellowship.